Now that you are on the road to having beautiful, straight teeth there	are a few things you need to know that will make living with your braces	easier. Having braces does not need to have a major impact on you lifestyle	but it is important that you take care of them and make a few adjustments	to what you eat and do so that your orthodontic treatment is hassle free. Brushing your teeth while wearing braces isn’t that much different	than brushing without them. After all, you’ll still probably use	a toothbrush and floss. However, making sure you do a good job is more	important than ever. When you’re wearing braces, food particles	and plaque have many more places to get trapped. If you don’t brush	and floss properly, your enamel may stain and your teeth may decay around	the brackets or bands. First, you need to carefully brush and rinse after every meal or snack	with a fluoride toothpaste and a soft-bristled toothbrush and a fluoride	rinse. Secondly, you definitely need to take the time to floss well between	braces and under all of the wires. Finally,	you need to visit the dentist regularly between orthodontic appointments	to ensure that your gums and teeth remain healthy throughout the process. 1. Prepare to brush. Take off elastics, and any other removable parts of your	orthodontic appliance. 3. Brush your teeth. Clean each tooth individually. First, place your brush	at a 45-degree angle to the junction between the tooth and the gum, then	apply gentle pressure as you move in a circular motion. Do this for about	10 seconds. Use the same brushing action on all outer and inner tooth	surfaces, tilting the brush as needed to better reach the insides of smaller	front teeth. 4. Floss once a day with super floss, a type of floss for cleaning around	appliances such as braces. Have your dental professional show you how	to use this floss, or follow the instructions on the product package. 5. Rinse and check your teeth. Rinse thoroughly with a fluoride rinse or water,	and examine your teeth and braces in the mirror. They should sparkle,	shine and feel clean. Remember, if you have any questions, do not hesitate to contact us at (410) 267-7300. There are certain foods that are a ‘no no’ when you have braces,	as they may damage them, but this is a small price to pay for having the	perfect smile. Don’t worry, you can still enjoy most of your favorite	foods but it is advised that you avoid anything too hard, chewy or sticky. Foods to steer clear of include bagels, licorice, caramel, chewing gum,	nuts, hard sweets and foods that are difficult to bite into, such as apples	and corn on the cob. Our expert team will advise you on what foods to	avoid when you have your treatment. The good news is that having braces does not stop you from playing sports,	however it is recommended that you wear a mouthguard to protect your teeth	and your appliance, especially if you are playing competitive contact	sports. Please ask someone from our team about a custom-fit mouthguard. If you ever have any accident while playing sports that affect your braces	just contact our office at 410-267-7300. Braces can cause some discomfort, particularly when you first get them. Your mouth, teeth and even your lips, cheeks and tongue may feel a little	bit tender and sore as your body gets used to the braces. This is nothing	to worry about, it is perfectly normal and the effects will not be long	lasting. If you are experiencing any difficulties adjusting to your new	braces then let us know. Tip:	We recommend dissolving one teaspoon of salt in eight ounces of lukewarm	water and gargling with it for a few minutes before spitting it out (please	do not swallow). If you are still experiencing discomfort after doing	this then try taking a pain reliever. We can also supply you with some	special wax to put over the braces to lessen the tenderness. In order to attain your new smile your teeth will need to be moved into	a new straighter and more aesthetically pleasing position. As such, during	your orthodontic treatment, your teeth can sometimes feel a little bit	loose. This is nothing to worry about and is all an essential part of	the treatment. Once your teeth have been repositioned and realigned, they	will no longer feel loose. 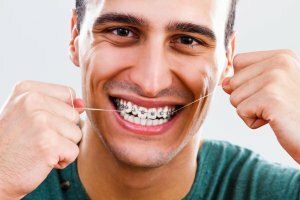 While you have your braces on you will have regular maintenance appointments,	however, every now and then, the wires and bands on your braces may come	loose or even fall off. If this happens simply call us and make an appointment	to come in so we can check and repair your braces for you as quickly as possible. If any piece of your appliance comes off, be sure to save it and bring	it to the office with you. Tip:	A handy tip to temporarily fix a loose wire is to use the back of a spoon	or the eraser end of a pencil to carefully and gently push it back into	place. If the loose wire is causing irritation you can put wax over the end to relieve any discomfort until you’re able to see your dentist. Damaged appliances can lengthen the time of your treatment, so make sure	you follow these few simple rules and do anything you are instructed to	do by your dentists with regards to your braces. Taking good care of your	braces will mean that your treatment will be as quick and smooth as possible. If you have any questions about your braces or your treatment plan contact	our team at (410) 267-7300.